Two teens say they were at the Jacksonville Fair Saturday when approached by a police officer who told one of them to tuck in his necklace or leave. He did not get a refund. Amy Donofrio, founder of the EVAC Movement to which the teens belong, says the 17 and 18-year-old boys were at the fair Saturday night when a police officer approached the elder telling him to pull his pants up. After complying, the officer turned to the other and told him to tuck his necklace into his hoodie, according to Donofrio. 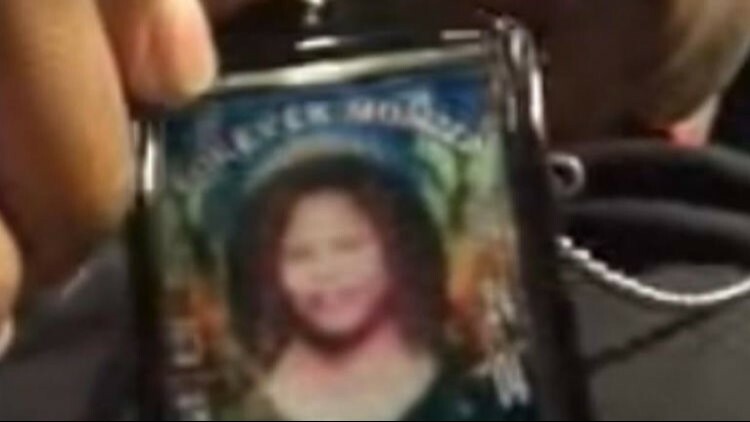 The 17-year-old refused to tuck in his necklace because it was a picture of his deceased mother, and he said he didn't understand why that wasn't allowed at the fair. "This is my mom why do I need to tuck it in?" the teen said he asked police. Donofrio said the two boys left right after refusing to tuck in the necklace with no further confrontation. Donofrio said the odd part was upon originally entering the fair, the security guard held the teen's necklace as he passed through the metal detector, then gave it back to him after passing through. It wasn't until about 30 minutes later when the officer approached them that he was confronted about the necklace and told to leave, she said. They were not refunded for their tickets, Donofrio said. She calls the policy "very concerning for obvious reasons," but even with that, says she has no problem following the rules. Her main issue is that no one knows about this policy because it's not on the fair's website or social media pages. After reaching out to JSO and the Jacksonville Fair several times, she was told memorial images are "mostly gang-related." The EVAC Movement is not a gang, and rather "more of a movement than a group," Donofrio said. She says they hope to make a difference in Jacksonville. The 'movement's' website says the group is dedicated to channeling painful personal tragedies into positive change. Donofrio said, "almost every youth member in EVAC has lost a loved one to murder or has had one incarcerated for a period of time." This explains the teen's memorial necklace, dedicated to his mom who passed away. Donofrio thinks people need to be alerted about this rule before going to the fair because it's "such a highly emotionally charged subject," and says is not a good topic to be an on-the-spot conversation. 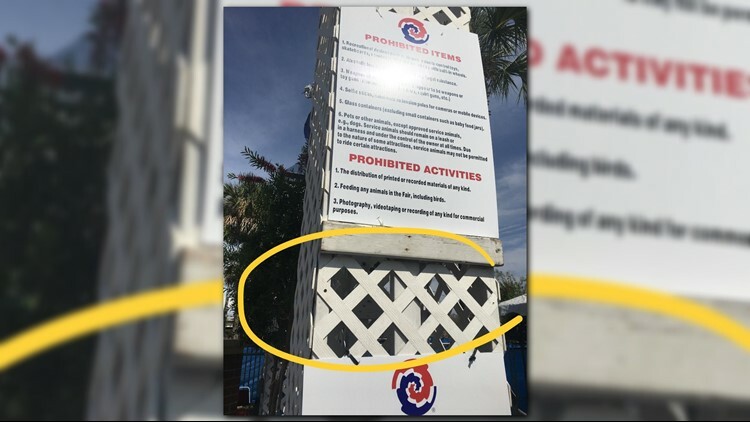 Under their 'Prohibited Items' list on their webpage, the fair does not list "memorial clothing or jewelry" which is written on the sign in front of their gates. The website does say, however, that they "reserve the right to deny admission to or remove any person wearing attire that we consider inappropriate or attire that could detract from the experience of other Guests." After asking the fair to post this policy on their website or social media pages, she says they declined to do so. 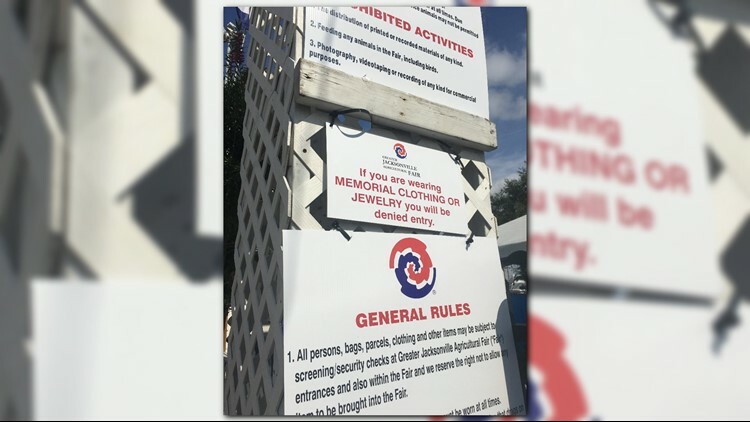 First Coast News reached out to the Jacksonville Fair for comment and they said the clothing policy is a "blanket rule" that applies to everyone and was put in place after advice of JSO. The fair is a private company on private property. The fair rules are posted on the private property. A private company can implement any rules they wish for their business. The individual was asked to place it under his shirt. The individual declined which prompted him being asked to leave. Any private business who requests security parameters, we assist with recommendations. It is up to them what rules they wish to enforce on their property. We have had violent incidents in the past at the fair. The safety of everyone going is our number one priority. The 18-year-old said he went to the fair Thursday to look at the sign to find the policy in writing, and it wasn't there. Ten minutes later after calling the fair back multiple times, they told him to come back around and the sign was now there. Watch the full report on this story at 11 p.m. on NBC 12 and ABC 25.